Where can you get an outdoor message board? Hertz Furniture carries a terrific selection so you can display information clearly to passers by. 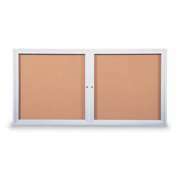 If you prefer to display your own flyers and posters, choose one of our weatherproof enclosed cork boards. 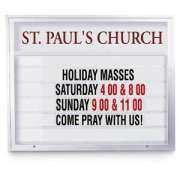 Letter board signs keep messages displayed clearly and visibly outside of your church or school. They are also easy to rearrange when there is something new to announce. They offer the ideal way to transmit information to as many people as possible. What kind of bulletin board is good for announcements? Tired of people constantly asking the secretary about announcements that they should have seen in E-mails or newsletters? 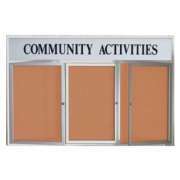 When you have an enclosed bulletin board right outside the entrance of a house of worship, school or community center, newsletters and fliers can be hung up in a prominent place and an organized way. 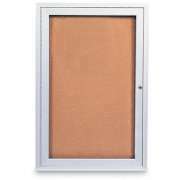 Unlike regular bulletin boards in hallways or other indoor spaces, enclosed tack boards that are mounted outdoors can be viewed even when the building is locked. They create the perfect way to ensure that everyone stays informed without having to constantly bother secretaries and administrators. 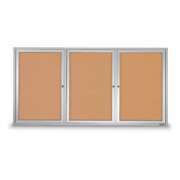 Bulletin boards come in a variety of sizes and surface materials. 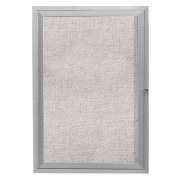 Shatterproof acrylic doors make it easy to view the papers inside while protecting them from the elements. Locking doors ensure that nobody will tamper with papers inside or use the space for unauthorized personal announcements and advertisements. 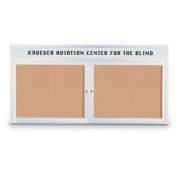 We have enclosed bulletin boards with classic cork or vinyl surfaces. While self-healing cork is easy to use, vinyl is a great choice for outdoor use because it won&apos;t fade in the sun like cork. What is an outdoor message board? To advertise to the broader public and make your message clear to all, you need some place to hang clear announcements outside. Outdoor directories have large lettering that stands out against a contrasting background, so it is easy to view your message from far away. This is a great arrangement for promoting community events, advertising sports games and conveying important information. 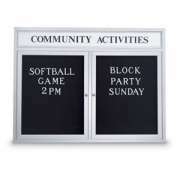 Outdoor message boards are available in either single- or double-faced configurations. Single-faced directories are good when the sign is facing the road, or on a one-way street, so anyone who is walking or driving by can read them. Double-faced models can be seen from both directions, which is ideal for a busy street where vehicles pass by quickly in two directions. With twice as much room to work with, the same message can be arranged on each side or announcements can be set up on one side with a special message on the other. How can I make my letterboard stand out? 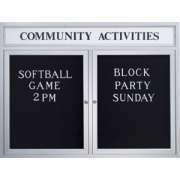 There are a number of enhancements that can make a bulletin board or letter board really stand out. 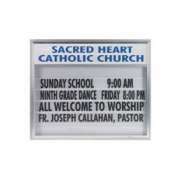 We have models with headers where you can display the name of your church, school or business prominently. 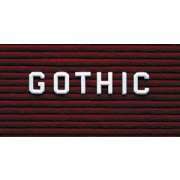 When people see your organization&apos;s name displayed in big letters on top of letter board signs, they are more likely to take note of it and remember what they read. Another way to call attention to announcements is to purchase an illuminated display. 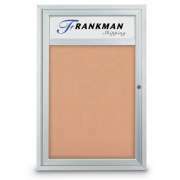 Built-in lighting on your outdoor directory will highlight contents in any weather, at any time of day. Rather than having to squint, slow down or stop to see exactly when the next town hall meeting or educational leadership seminar is, people can simply view the directory board regularly. 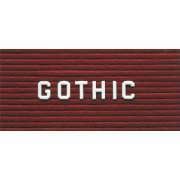 With great lighting, your changeable letter boards will always stand out and draw notice. Where should I put the letterboard? When choosing a changeable letter board that is meant to be outside, it is important to take note of where it can be mounted or installed. Some directory boards must be under an awning or overhang. 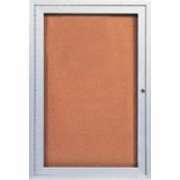 While they are built for outdoor use, they may not be able to stay in great condition when directly bombarded with harsh rain or snow. However, many letterboards are designed to be placed anywhere in the great outdoors, so your messages and announcements will stand out in any kind of weather. 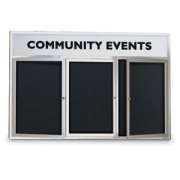 At Hertz Furniture, we know that every institution has unique needs and spacial arrangements, so we offer a huge variety of enclosed bulletin boards and letter boards. With various sizes and styles, you can select the best options for the space that you have. 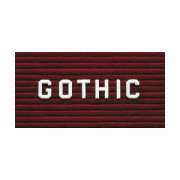 Our outdoor letter boards come from reliable manufacturers including Aarco and United Visual. For a free consultation regarding sizing, ordering or placement, contact the experts on the Hertz Project Solutions Team.